Pizzelle (pronounced with "ts" sound, like "pizza") are traditional Italian waffle cookies made from flour, eggs, sugar, butter, and flavoring. 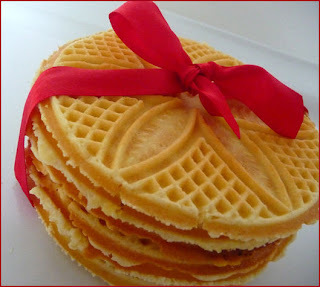 They are baked on a special griddle, similar to a waffle iron, and make large, delicate, crisp cookies. I offer anise (traditional), lemon, and vanilla flavors. They will be available in packages of a dozen. 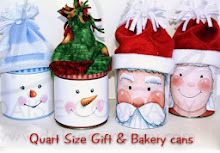 While supplies last these are offered in a gift tin ($6.50) or decorated cello bag ($5.00). These are really popular and usually sell out fast! If you are interested, please let me know ASAP. 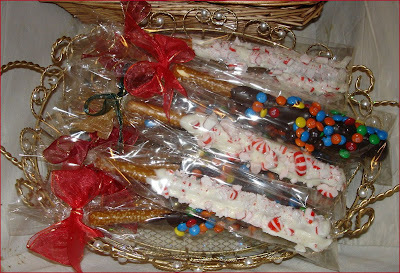 Pretzel rods that are first hand dipped in caramel, then into chocolate, and sprinkled with a variety of toppings. 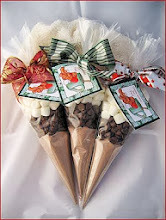 Cocoa cones are available in in assorted flavors. Each cone makes enough for 2 8-ounce mugs of cocoa, or one really big one. Each cone comes with "mix-in" and is topped off with mini marshmallows to add on top. 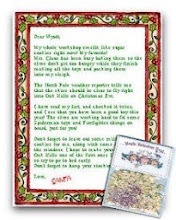 These are great stocking stuffers - they look great tucked in the top of a Christmas stocking. 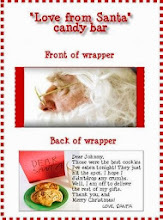 Paired with a mug, it makes a great teacher's gift! You can often find cute mugs at Michael's or the dollar store - for under $10 you'd have a great gift! *For a limited time I will have several styles of Christmas mugs available for $2 which can be paired with the cocoa cones for an inexpensive gift.